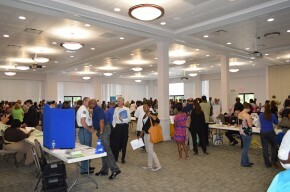 The Catawba Regional Workforce Investment Board conducted its annual Job Fair on May 23, 2013. The fair was held at the Conference Center at the Gateway in Richburg, SC. The fair drew 40 employers with over 600 job openings for area job seekers to apply. More than 1,000 job seekers were in attendance with many leaving the fair with interviews and potential jobs. Additional sponsor of the event were: ChooseChester, SC Works, Catawba Regional Council of Governments, SC Department of Social Services, York County Economic Development, Lancaster County Economic Development, SC Vocational Rehabilitation, B.R.O.T.H.E.R.S., and SC JUMMP.